10 quick tips on keeping exercise fun and taking care after your workout. The beautiful weather isn’t going to stick around forever, so embrace the elements with summer exercise sessions. 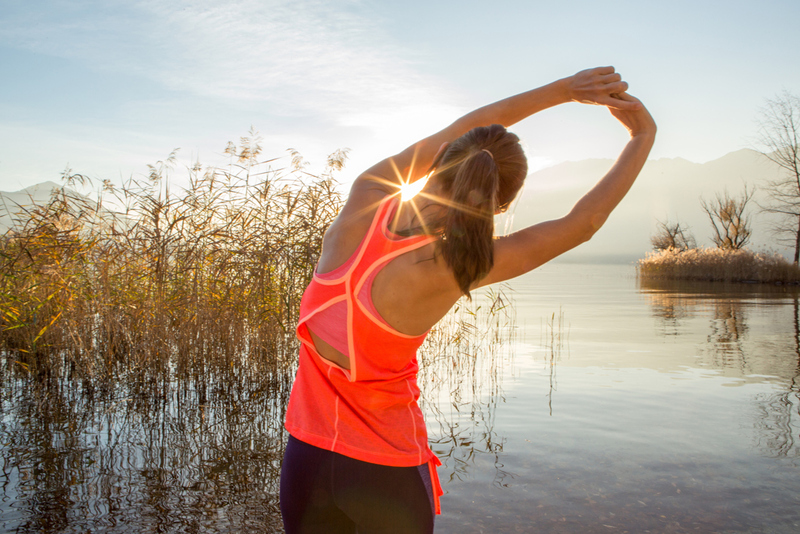 Long days, sunny mornings and balmy evenings make for a winning workout combination. Swap the gym for morning runs, indoor pools for beach sessions and make time for regular evening walks to unwind. Mentally shifting from ‘exercising’ as something you have to do, to embodying an ‘active life’, can be a game changer. Instead of seeing exercise as one of the must-dos in the checklist of your day, try incorporating it into your day. Ride to work as your commute, walk to the shops to get your groceries, or run to a local café to meet friends instead of driving. The new year represents a great time to try something new. How about reconnecting with the sports of our youth, like cricket, footy and netball? Take a deep-sea diving course, try trail running or simply start small by committing to a 30-minute walk each morning or evening over summer. The sporting calendar is packed with activities to help you plot your fitness goals, offering motivation and inspiration to carry you towards completion. From fun runs to mini triathlons, ocean swims, yoga challenges and cycling events, there’s something on the health horizon for everyone to aim for. You don’t have to go it alone. Including friends, family members, neighbours or colleagues is the easiest way to kickstart a summer exercise plan. From a post-Christmas lunch powerwalk with family members, to committing to a lunch-time jog each week with a colleague, help each other achieve fitness success. Are you tired of hearing yourself say how busy you are? Sometimes when it comes to our fitness, something has to give. Enter ‘the swap’. If you’re just not finding the time in your schedule to fit in at least 30 minutes of exercise each day, is there something that could be swapped out? Consider how much TV you might be watching in the evening, how long it’s taking you to prepare dinner, how you spend your weekends and how long your commute takes. Where can you make inroads in saving time – like preparing meals on the weekends, watching 30 minutes less TV a day, working out on a lunch break or waking up half an hour earlier? Consider if it’s viable for you to ensure your health and fitness goals aren’t being neglected. Summer is a peak time for people trying out new exercise regimes. With lots of us inspired to take on new fitness challenges, Professor David Cameron-Smith shares some advice for how best to recover. Be well hydrated before, during and after exercise. Becoming dehydrated increases muscle damage. Muscles take a while to become compliant and flexible. This can be achieved with a combination of gentle stretching and warming up exercises, where you go through the motions slowly and without pressure. Most severe muscle soreness follows intense and unfamiliar exercise, so it’s important to gradually build up. Exercise gradually and build up to more intense and sustained exercise as part of a lifestyle or training program. Give your muscles a chance to rest, repair and regenerate for a stronger you. In addition to resting, it might also be advisable, if the pain is severe, to treat the muscle soreness as if it’s an injury by using the R.I.C.E technique (rest, ice, compression and elevation). Antioxidant rich fruits, such as blueberries and dark cherries, reduce the level of muscle inflammation and can speed recovery. Fish and fish oil is rich in anti-inflammatory omega-3 fats. These essential fats reduce the severity of inflammation and speed recovery.